Build your own PC with the 32GB Ballistix Sport LT DDR4 Memory & MSI B450-A PRO AM4 ATX Motherboard Kit from B&H. 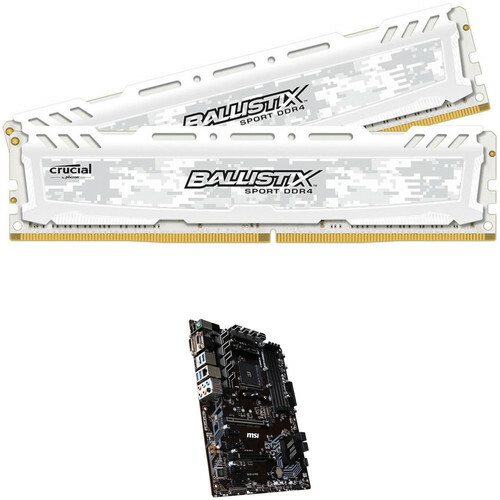 Designed for gamers and performance enthusiasts, this pack of Ballistix Sport LT memory includes two 16GB modules for a total capacity of 32GB, which is enough for gaming, everyday tasks, and content creation. The motherboard supports socket AM4 processors and features enough connectivity options for multiple storage drives and PCIe expansion cards. Aside from these two items, you'll need other components for a complete system. The white 32GB Ballistix Sport LT Series DDR4 2666 MHz DR UDIMM Memory Kit from Ballistix is a set of 2 memory units, each of 16GB capacity. These are unbuffered, non-ECC modules that operate on a frequency of 2666 MHz for use with DDR4 compatible systems. With a digital camo design and an integrated heat spreader for enhanced thermal performance, these modules look cool and stay cool. It features XMP 2.0 profiles for easy configuration in Intel-supported systems and engineered to deliver fast and reliable performance memory for enthusiasts and mainstream users alike. The B450-A PRO motherboard is equipped with one PCIe 3.0 x16, one PCIe 2.0 x 16, and four PCIe 2.0 x1 slots that can be used to mine crypto currency. Moreover, it has multiple hardware and software features designed for efficient mining and management such as Diskless Boot support, which enables you to mine crypto currency without having an operating system. This motherboard is equipped with six fan headers that support both DC and PWM modes, so you adjust their speeds either manually or automatically within BIOS or a third-party software to find a balance between cooling and noise. MSI Audio Boost consists of both hardware and software additions that are designed to provide you with a high-quality listening experience. The left and right channels are built on separate PCB layers, De-Pop Protection prevents loud popping noises, an EMI-shielded audio processor ensure clean stereo and surround sound, and a dedicated headphone amplifier automatically detects the optimal impedance for your headphones. For gaming, Nahimic 3 provides you with virtual surround sound with an in-game overlay that displays where noises are coming from. There are four SATA III ports on this motherboard designed for traditional 2.5" and 3.5" drives. Moreover, it's also equipped with a single M.2 slot that can utilize the PCIe 3.0 x4 interface for speeds up of up 32 Gb/s when used with a compatible NVMe drive. For an additional boost in performance, you can enable X-Boost within MSI's software. The DDR4 memory slots on this motherboard are built with an optimized memory layout to offer stability, performance, and low power consumption. Additionally, this motherboard supports XMP for enhanced RAM speeds. Please note that A-series/Athlon processors support up to 2400 MHz, and the supporting frequency of memory varies with installed processor. Box Dimensions (LxWxH) 6.8 x 4.7 x 0.5"